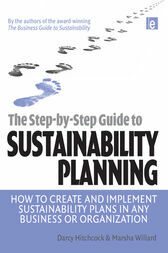 Sustainability is now the greatest business imperative, yet how do you actually develop and implement a sustainability plan if you aren�t an expert?From the authors of the award-winning handbook The Business Guide to Sustainability comes this highly practical guide to designing and implementing a customized sustainability plan in any business, organization or government department of any type and scale.This step-by-step guide explains how to create a sustainability plan and sustainability report. Each chapter has two vital sections. The first contains background reading, tips and case examples to help you be successful. The second presents a set of methods each with step-by-step instructions and a selection matrix to help choose the best methods. The book also contains sample worksheets and exercise materials that can be copied for organization-wide use. Darcy Hitchcock and Marsha Willard are authors of The Business Guide to Sustainability, winner of Choice Magazine�s Outstanding Academic Title award for 2007. Their firm, AXIS Performance Advisors, is based in Portland, Oregon. They both teach in Bainbridge Graduate Institute�s MBA in Sustainable Business and the executive management team for the International Society of Sustainability Professionals.